Spider-Man is among the most awaited PS4 games this year. The Spider-Man PS4 game is scheduled to release in September this year, but fans are ready to pounce on any detail they can get before that. One such detail surfaced in the form of a leaked video showing a Kingpin boss battle. It was already known that Kingpin would be one of the villains in the Spider-Man PS4, but other than that there were no more details. Now, thanks to this new phone-recorded Marvel’s Spider-Man gameplay footage, we now know how the battle between the two will be. The leaked video appears to be from VK Fest in Russia. The video is a short clip and is not the best quality, but is clear enough for you to recognize the mob boss and Spider-Man. Further, the leaked video from a gameplay demo appears to be of Kingpin’s penthouse or base of operations. It must be noted that the latest video is different from the earlier battle footage, where Kingpin’s fight looks choreographed. In the latest video, Kingpin’s fight is more freestyle, and this makes sense also as he doesn’t have any special powers, and is known to be an expert in hand-to-hand combat. In the footage, Spidey is shown being knocked around by the mob boss. Further, the leaked video suggests that Kingpin with his bossy type fight would have a substantial role to play in the game. But, whether he is part of the main storyline, or a side mission, is not clear for now. The Spider-Man story trailer showed Kingpin behind bars. So, there are chances that he is part of the breakout shown at E3, or he is there in the game as the tutorial boss to help the players learn some tricks. Developer Insomniac first hinted of Kingpin in an insight video, which included concept art of Spider-Man while taking on the powerful mob boss. Kingpin joins the growing list of villains that Spider-Man must face to bring peace to the city. Though the Spider-Man PS4 game does not include every fan-favorite villain, it does feature many popular ones from the comic book franchise. The Spider-Man PS4 game was first announced over two years ago. However, except for the last few months, there have been almost no updates about the game. A new story trailer of the game was shown only at the Comic-Con 2018. It is now known that the upcoming game will have no direct connection to any Spider-Man story of past video games or the Marvel Cinematic Universe. Further, according to Insomniac, Peter Parker’s origin story is not part of the new game, it’s considered ancient history now. In the game, Spider-Man is 23-years-old, suggesting that he has been fighting crime for about eight years. So, we can expect our hero to fight many iconic villains in the game. Some villains that showed up in the game’s E3 trailer were Electro, Negative Man, The Vulture, Rhino and The Scorpion. Now, thanks to the latest leaked video we know that Kingpin also joins that list. Also, we can expect the game to feature more villains, considering the fact that the trailer showed Electro freeing almost all the criminals from the RAFT Prison. Spider-Man PS4 game – what to expect? There have been guesses that the game might feature Avengers as well. 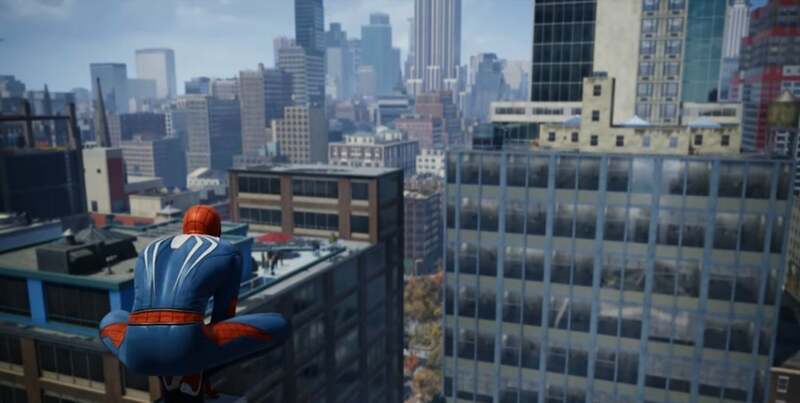 In-game footage shows the hero swinging through Manhattan with the Avengers tower in the background. It might very well be a coincidence as the building is part of the Marvel comics universe, but there have been more hints at E3. A display featured a reference to Daredevil’s law firm, while a prop newspaper had real-estate ads for the property holding the Avenger’s mansion in the comics. Further, the Spider-Man PS4 game will have one more playable character, and it will be Mary Jane Watson. It is not very clear how she will be involved in the game, but according to creative director Bryan Intihar, she will be something like an investigative reporter. “Mary Jane’s going to surprise a lot of people in this game,” Intihar said. For players not comfortable with Spider-Man’s new look, they will have more options. Insomniac has confirmed that players can choose from various alternative costumes, including a punk rock Spider-Man outfit and a costume from Avengers: Infinity War. Spider-Man is exclusive to the PS4, and is scheduled to release on September 7.